There is so much to see in Ireland and there is no better way to see it than to travel with professionals who know their country. Better still when they do the driving and all you have to do is to sit back and relax and enjoy the ride. 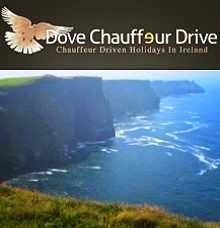 Driving in Ireland is not easy for anybody coming from a country where they drive on the opposite side of the road as many of our roads are narrow and winding especially in the rural areas where the most beautiful scenery is to be found. Driving through the Kerry mountains in places like the Conor pass where there is barely room for two cars to pass is not for the fainthearted but places like this have to be seen to be believed and appreciated. No two people are the same and we tailor a plan to meet your needs, with your help. We can arrange everything from your itinerary to your accommodation and all you have to do is to get yourself here. We do not get involved in flight arrangements but we will be at the airport when you arrive and deliver you back on time for your flight home. What could be easier. An e-mail or a phone call is all it takes and we welcome all enquiries. We can help you to choose accommodation to suit your own particular tastes from B&B’s to hotels to castles. You let us know what you want and we do the rest. While traveling ,we know the best places to eat with the best quality and value and also places where you can enjoy some time shopping. Our holidays can be tailored to suit whatever time frame you may have available so whether it is three days or three weeks we can look after you. When you travel with us there is a flexibility that you cannot have on bus tours and holidays of that nature and even though we do have to make sure that we get you to your final destination each day there is a lot more freedom.